PGS Plumbers have a core team of Plumbing engineers operating in and around Wimbledon, London. Our expert engineers are fully Gas Safe (CORGI) registered and are equiped with the tools, training and vast experience to ensure that your job is completed in a timely and professional standard. Our Plumbing and Heating services for Wimbledon include all general plumbing jobs, such as water leaks, shower replacement and drainage. 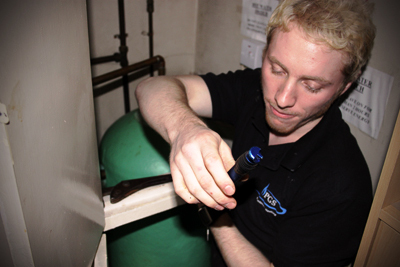 There is no job too big or small for our expert plumbing engineers so give us a call on 0203 674 1686 now for further details. The Wimbledon-based team of PGS engineers are friendly, trained to the highest standard, tidy and most of all - have vast experience in the industry. You can find interviews with some of our engineers on our PGS engineer profile page. This team are available for our 24-hour emergency call out service, giving you peace of mind day and night. We'll take on any Plumbing & Heating job, no matter the size! PGS Plumbers are also experienced in bathroom fitting, so if you need a new bathroom basin installed, a power shower replaced or your entire bathroom fitted then contact us now for quotes and free advice. On top of this, all our engineers are Gas Safe registered. Gas Safe is the governing body behind the current legislations against underqualified engineers doing gas related work that they are not qualified for. You can be assured that all our engineers are registered Gas Safe professionals and have the experience, training and accreditations needed to safely repair, service and install your gas appliances in Wimbledon. Call PGS Plumbers, your local Wimbledon Plumbers, now on 0203 674 1686 or request a call back from the form above.